Asheville retail has not seen much coverage, and much of this accounts from the fact that most visitors to the city are not real focused on this for obvious reasons. On top of that, apparently not many retail photographers reside in the area. In all, most trips to Asheville for most people involve the Blue Ridge Parkway, Biltmore House, hiking and general sightseeing. For me, that was indeed always the case...too busy doing vacation-type things to pay much attention to the city itself. In fact, only recently have I really explored the city in depth myself. 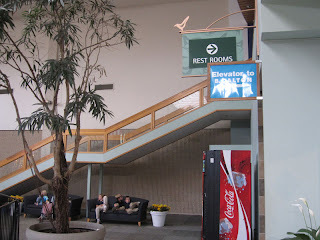 On previous trips, I was not able to cover much of the city in pictures, but with this post that changes as I cover the most important and successful mall in Western North Carolina. 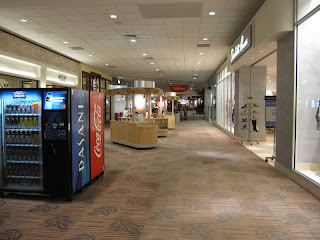 My first North Carolina mall entry, Asheville Mall is a truly fascinating mall. In fact, I doubt that anything compares to the downright strange and unique elements of this mall. Asheville Mall came in as the second mall in the city, opening in the 1973 on a hillside on Tunnel Road (US 70/74A) just off of I-240. At the time it was built, I-240 was not yet completed east of downtown and US 70 was an extremely crowded thoroughfare. The road it is on is named for the long tunnel into downtown about a mile west of the mall. This is technically a single level mall, but this is indeed technical, which I will explain shortly. The mall is today anchored by Sears, Dillard's Men's, Dillard's Women's, Belk, Barnes & Noble and JCPenney. The old part of the mall has a very retro feel to it. The side window skylights, scattered overhead skylights and sea green color scheme feels like an ethereal 1960's mall. This part of the mall is flanked by Belk, Sears and both Dillard's. On the last photo, note the new Barnes & Noble on the right. Readers, you will need to correct me but I am going on subjective accounts of others and piecemeal information when I post this. No mall has had as radical of transformations, and also no mall lacks historical information more than this one. 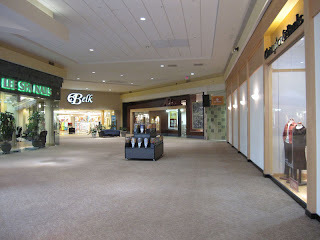 When the mall opened, the mall was vastly different from today. At the time, the mall had three anchors, two which still exist today. Those anchors were Bon Marche, Belk and Sears. Do not confuse Bon Marche with the one in the Pacific Northwest. This was an Asheville-based store that also had a location in Charlotte at long-defunct Charlottetown Mall. When first built, the mall was a simple I-shape with a continuous slope throught. Bon Marche was located where Dillard's Men's is today. Not long after, Ivey's also added onto the mall closer to Belk as well. This is where Dillard's Women's is today. Here is a look at all the anchors on the old part of the mall. Note the open glass overlook in the second floor of Dillard's Men's store. That hallway has one of the most beautiful showcases of natural light I have ever seen in a mall. The second Dillard's is built into the hallway like an inline tenant, and it was previously an Ivey's. The Belk is original, but has been renovated to the point it looks like a new store. Note the Starbucks on the right of the last photo. 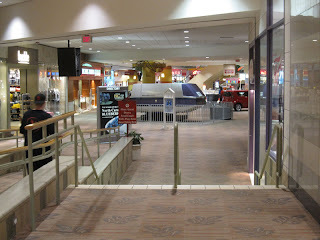 This is the northwest mall entrance, the first of three. Asheville Mall in its original incarnation had some really strange quirks. A second level was built on the east end of the old mall that went up to nothing more than a B Dalton bookstore. This was originally for a two-level J&S Cafeteria with seating areas on the second level. This store was gotten to by stairs and an elevator going up and a down escalator coming down from it into the main mall. With that, a small catwalk connected to that central escalator. This is one of those neat things that other malls should have emulated more, and this feature remains today. 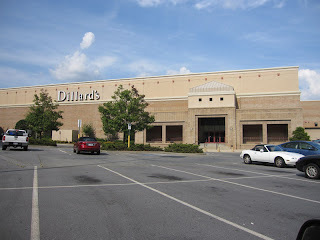 I am also roughly gathering that near the Dillard's Women's interest was an escalator down to a lower level of the mall that had a Piccadilly Cafeteria that we ate at then, but I cannot confirm this area since that is a memory from the late 1980's. I am honestly not sure where this corridor went. If this was not where it was, then what is obvious from aerial photos is that a mall corridor stretched between what is today the joined Dillard's stores. This was possibly where the two level portion was, but I am not sure if or how it connected outside if so. The steps on the left go up to the former B Dalton. I last visited this store in early 2007, but was unable to take a photo then due to a very high security presence. The entire corner there was made up of the bookstore, which closed in early 2009 when Barnes & Noble formed a new two-story anchor. 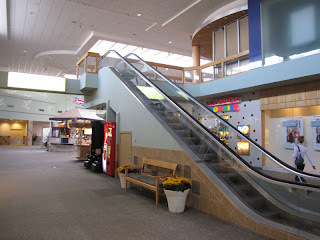 Here is a look at the down escalator from the store that was B Dalton and originally J&S Cafeteria. While patrons had to go up stairs or an elevator to go in, they could leave via the escalator. It is very interesting how they built a catwalk over to the esclator going into the middle of the mall. This is my favorite mall oddity of all time. The sign next to the stairs still reads "Elevator to B. Dalton". Barnes & Noble has phased out most of the remaining B. Dalton locations. This was possibly the last. Because of sparse parking around the mall, the back of the mall was built originally with a one story parking deck over the back parking lot. This parking deck comes to a catwalk that crosses over the rear mall entrance onto the roof, yes the ROOF, where you walk along it to double doors into the upper level of Dillard's Women's. 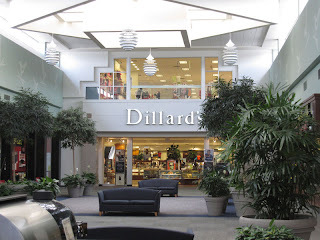 The Dillard's Women's has a mall entrance next to the old B Dalton, while the Dillard's Men's is closer to the Sears. Neither store is clearly indicated which is which. The Men's store comes off of a wing with a window on the second floor overlooking the mall. This was last used as Montgomery Ward. Here is a look at the crossover section between Belk and Dillard's Women's. This section is squeezed between the two stores to reach the expansion to JCPenney. 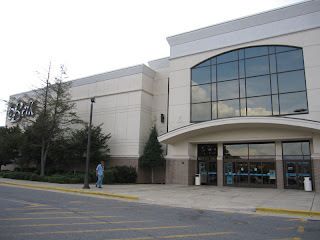 This apparently replaced a previous mall corridor between then Dillard's and Montgomery Ward, and I am curious as to how this connected to the 1989 JCPenney wing. I understand this is close to where the old two-level wing was, and this makes me wonder if a basement level ducked under Dillard's/Ivey's. Was this wing closer to Belk previously? I absolutely cannot figure this out, but I do remember Piccadilly was on that lost lower level wing. The wing going up to Penney's does not stop with the weirdness. Essentially, part of it is squeezed between Dillard's Women's and Belk and the wing then turns off toward Penney's. This wing also has the second of THREE Belk entrances into the mall. The third entrance comes off a newer wing near the food court. The food court is also strange in that the parking deck partly overlaps it. The food court wing also contains a weird side entrance that goes down a long hallway with no stores whatsoever. The result of the overlapping parking deck was the installation of a pair of escalators going straight up into the parking deck. This also gives the mall a bit of a "second level" in addition to the former B Dalton. In addition, this second parking deck is three stories tall. The JCPenney wing is not as nice as the original mall. It is darker, plainer and boring and according to what I am understanding looks far older than it actually is, apparently designed to match the original mall. This wing provides access to the rear parking deck and the southwest mall entrance to Belk. Supposedly this was added in 1989. 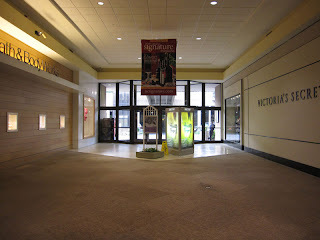 The southwest Belk entrance, second of three mall entrances. Looking up mall on the JCPenney wing. 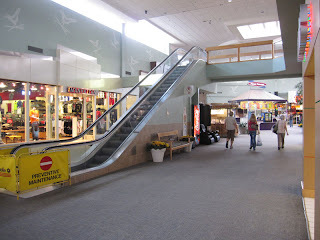 Like the original mall, this wing features continuous stairs and ramps. 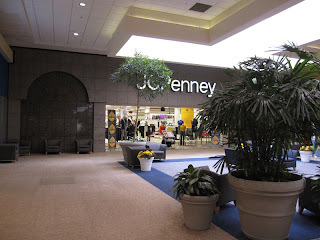 The JCPenney mall entrance definitely looks 1989 despite the otherwise 70's design. 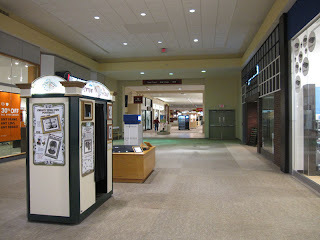 Hallway to the rear mall entrance connects off the Penney's wing across from the second Belk entrance. This rear entrnace has never been renovated unlike the ones in the front of the mall. 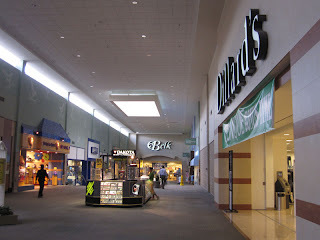 Asheville Mall was expanded twice: the first time in 1989 (to compete with Biltmore Square) and again in 2000. The JCPenney arrived in 1989, and this wing looks to have been added in the late 70's or early 80's even though it is said to have opened in 1989. This JCPenney moved from downtown, though I had originally assumed it was Innsbruck Mall. The addition created a new wing that gutted part of Dillard's/Ivey's coming down the side of what is now Dillard's and continued to the store. This addition was designed differently from the original wing with less light and a more basic design. 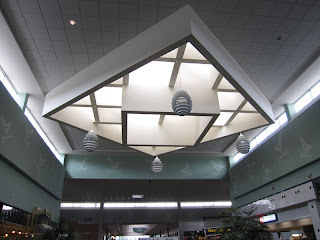 I understand, too, that the connection to this wing was altered with a lower level removed when the second renovation occurred, also resulting in the loss of a twin screen cinema. The odd design today was most likely to keep the mall built within the most level part of the mountain without having to construct two levels. This was for the best overall as most two-level malls are actually pretty boring since they inevitably lead to a generic appearance. A mall layout like no other. Any questions? 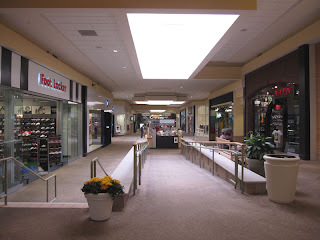 This very dark part of the mall is the portion of the mall connecting from the JCPenney wing to the food court. The wing extends from the JCPenney entrance court. The lack of natural light is due to the fact that part of the parking deck overlaps this area.. 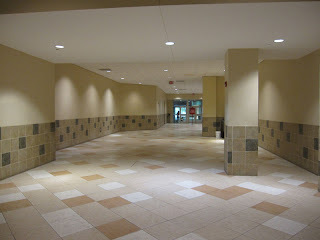 Along the hallway between the food court and the JCPenney court is this long hallway to the parking deck. This is very strange to see such a long hallway with absolutely no stores whatsoever. The mall has seen quite a bit of shakeup in anchor tenants since it opened. Apparently the Dillard's Women's store opened as an Ivey's in the early 1970's, relocating from downtown. Montgomery Ward was previously there from 1994-2000 (the 1994 date is from Mall Hall of Fame). The Montgomery Ward, today the Dillard's Men's, had originally opened as Bon Marche, converting to Meyers-Arnold in the late 70's and Upton's for a brief period from 1987 to when Montgomery Ward took over the store. Upton's had bought out Meyers-Arnold in 1987, but Upton's went out of business in 1999. When it did, it apparently had previously left markets outside of Georgia. 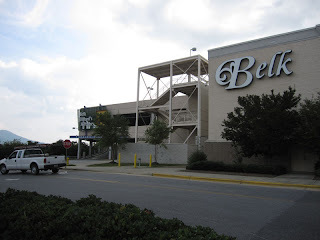 The Belk that is there today is also a significant expansion of the original store, which added a second level in 2000. Also, JCPenney, of course, came on board in 1989 with a new wing. In all, the mall has seen an enormous amount of changes over time. I know when I visited in the late 1980's, the mall had the typical brown tiles of most 70's malls, and I distinctly remember two levels with an escalator in one part of the mall, which it definitely does not have today. 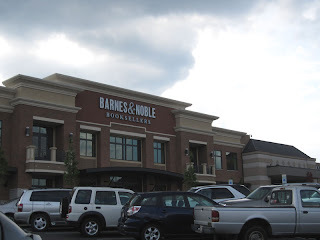 In early 2009, Barnes & Noble opened in the front of the mall, replacing a McDuffey's restaurant, a Gap and a few other tenants. This two-story store resulted in the closure of B Dalton, but it also added a significant non-apparel anchor sure to drive traffic to the mall. I am hoping that the mall owners find an appropriate tenant for the old B Dalton, and that that they do not ultimately remove this neat little second level concept. 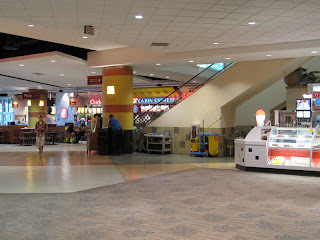 Looking here at the food court, which forms the east side of the mall. This rather dreary dining area is joined with two escalators, but where are they going? They are going to nothing more than the parking deck, which sits over the top of this part of the mall. Today, the amount of tweaking it took to put such a massive one-level mall (nearly 1,000,000 square feet) on such a difficult footprint has really paid off. They have now emerged as the leading mall in the city and the retail hub of the area. The mall's only competition, Biltmore Square, is withering away from the impact of Asheville Mall as neither the population could support it nor could it hold a candle to the wonders of Asheville Mall. The mall did a good job expanding and reacting to competition, and at this point they are pretty much invincible in a city noted for its tourism and overally prosperity. Pictures do not really do justice to this place, however, so I recommend that others come and see it for themselves. Perhaps they can do this when they arrive to see the leaves this fall! The southeast wing forms the last sector of the mall. With no outside entrances, this wing extends from the food court to the southeast Belk entrance, which is the third of three entrances pictured. The second photo is looking backwards on this wing to the food court. 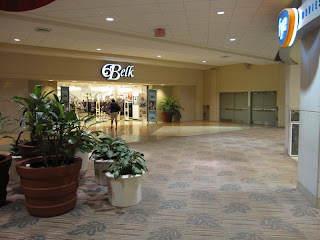 A view of the Belk mall entrance, which also features a very large emergency exit on the right. No alarms and no surprises, right? 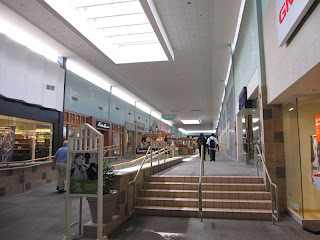 Rear entrance to the mall into the JCPenney wing. This is all original, and note the overhead catwalk. Notice that it heads onto the roof. Now see below. Yessir, you are on the roof. On this roof, you are headed to two double doors. Those two double doors head to Dillard's, previously Ivey's. Sears, Dillard's Men's and Dillard's Women's. The first was the former Montgomery Ward/Upton's/Meyers-Arnold/Bon Marche and looks to have been renovated extensively since a rear mall entrance originally came off one side of it. The second entrance is to the former Ivey's. Okay, maybe Penney's opened here in 1989, but it sure doesn't look it. Note the second level parking deck entrance on the first photo. Belk here looks new, but it is not. It was just reworked to have a second level, resulting in a redesigning of the store. This was done in the 2000 renovation. Looking back here at the three level parking deck next to Belk and the three story stairs next to it. How else are you going to have an adequate parking lot on a mountainside? Barnes & Noble, the newest anchor, looks a bit out of place with its faux traditional exterior on a modernist mall. It does look nice, though. Of course, it still pisses me off they closed the B. Dalton in the mall for this. Now for the mall sign. I didn't really cover the Old Navy in the mall, which was loosely pictured in the original mall section. Those random shapes are a bit weird, and the sign looks like it hasn't held up well. I've been in this mall once and it looked as if it was supposed to have been a 2-level mall, but was made into a one-level instead. I noticed that there was a lot of space above the store fronts in parts of the mall as if it were planned to add a second level. It was definitely the oddest one-level mall I'd ever been in. This was in the mid to late 90s. I remember that B. Dalton and wondered why that weird second level was there, and if they were making it into a 2-level mall. It's a shame this is so far away from where I live because I'd love to go back. 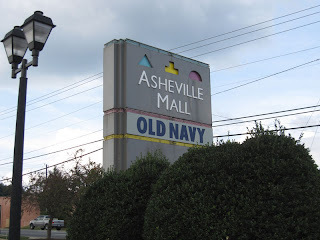 As you say, the history of ASHEVILLE MALL is among the most poorly-documented in all malldom. Add to this the perplexing series of anchor changes and you have one confusing story! A reliable info source is the Buncombe County GIS website. Locating the ASHEVILLE MALL property confirms a few details...and not with subjective accountings. Sears is listed as being built in 1971. Further digging shows that the remainder of the original mall was built in 1973. Digging even further, you will find that J.C. Penney is listed as being built in 1989. The site has a circa-1985 aerial view of the mall. Penney's is nowhere to be found. All that surrounds the Sears -to- Belk mall is a large parking lot. Now we come to the befuddling part of the mall's non-documented history. 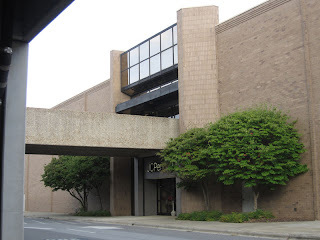 The '70s mall had Sears (NW end) and Belk (SE). There were two smaller-size anchors along the SW facade. What were these two store spaces in 1973? I believe that the north jr. anchor was an (Asheville-based) Bon March and the south was Ivey's. So, this would make the mall's four original anchors Sears, Belk, Ivey's and Bon Marche. All the subjective accounts leave one more confused than ever. I found a reference saying "Bon Marche became Upton's". Another says the north jr. anchor was originally Meyers-Arnold. If the mall originally had a Bon Marche and Meyers-Arnold...where was Ivey's? Obviously, the only way this confusion is going to be cleared up is for research to be done, using 1970s Asheville newspaper articles as sources. A trip to the Asheville Public Library would be involved. If anyone out there lives in Asheville, and is interested in malls, maybe they could take time and look up the grand opening of ASHEVILLE MALL for posterity (please post to the Mall Hall of Fame if anything is uncovered in this manner). If the mall did have Sears, Belk, Ivey's and "The Bon" as original anchors, the north jr. one must have been rebranded by Meyers-Arnold. We know that Meyers-Arnold became an Upton's in 1987. I believe that this store closed in the early 1990s. Granted, Upton's did hold out till 1999. I can't find a source stating that Montgomery Ward opened in 1994, but I have concrete proof that the store was in operation before '99. In the March 1, 1998 Retail Traffic is mention of the mall being bought by CBL. 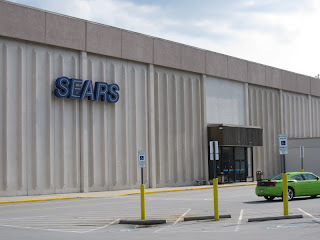 The anchors listed were Sears, Belk, JCP and Montgomery Ward. Well the Bon Marche was bought out by Ivey's, and Meyers-Arnold was bought out by Upton's in 1987 (confirmed). My guess is that Upton's didn't do too well in Asheville, and that's where Montgomery Ward came in. Ivey's was not originally at the mall...they came in by buying out Bon Marche. The reason I was confused on the JCPenney opening in 1989 is because the addition was built 70's style (apparently to match the older mall). I also confirmed the other day that there was a two level section in front of Dillard's/Ivey's (the upper level window today) and apparently some escalators dropped down in the area of Dillard's/M Ward in front of Belk and had an outside entrance somewhere. This is the part I remember. Okay, had it backwards according to GIS. Ivey's/Bon Marche was the store closest to Belk while Montgomery Ward/Upton's/Meyers-Arnold was closest to Sears according to the GIS site. ...also I think I see that the lost lower level might have dropped down under the current mall hallway that cuts between Belk and Dillard's South. This all sounds logical. I revised my Asheville Mall article (for the 3rd time in 2 days) indicating Meyers-Arnold as the original north junior anchor and Bon Marche as the south. So....the north jr. anchor was a Meyers-Arnold, Upton's, Montgomery Ward and -lastly- a Dillard's Men's. The south....Bon Marche, Ivey's, Dillard's and -then- a Dillard's Women's. I hope I have it right now, hee hee. I'm leaving the article like this and changing it ONLY if I have access to the vintage, early '70s newspaper article(s) I mentioned....which would indicate something different. I'm still rather baffled by the Bon Marche/Ivey's buy out. We know that a Bon Marche was in Charlottetown Mall in '59. I read that James Rouse was riled when the store closed only a couple years later. If Ivey's bought the Bon that far back, they must have kept the chain going -as Bon M- until 1990...but closed (and eventually took over) the C'town store, in the early '60s. Was there ever a Hecht's in the Ashville Mall. I remember hearing a rumor that they would take the old Montgomery Ward space when they was going out of business, but I moved shortly after that time to Durham. Did they even consider locating in Ashville. Just curious? 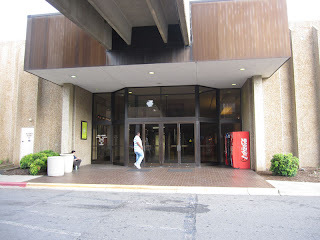 JC Penney and Ivey's were originally at Innsbruck Mall which had a vintage Ingles Supermarket until about 2 years ago. The JCPenney at Innsbruck is evidenced by the Firestone Auto Center still standing. I didn't get to Asheville much in the 90's, so I don't recall Montgomery Ward or Uptons. Meyers-Arnold is a vague memory, as they were from Greenville, SC but Bon Marche draws a blank. Also I believe S&S Cafeteria predated Piccadilly. They seemed to associate with malls anchored by Sears in the Carolinas during the 60s and 70s. Ivey's and Belk were originally in Asheville's downtown along Patton Avenue. I don't know if these stores replaced downtown or if they slowly died after the mall stores came along. From all appearances, Dillard's must have blocked Hecht's from entering the mall, though I really do not know the answer to that. Most of what I know about the mall is third party information and that it grew to the size it is now at the expense of Innsbruck. 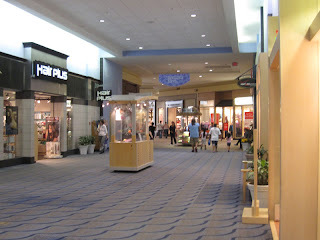 Prior to 2007, I visited the mall once in 1988. Ken, thanks for the info. My post next week is Innsbruck Mall and I updated the information with you credited. I could not find that information otherwise online. This is about as confusing as it gets, and now I'm wondering if what I thought to be true really is> At any rate, what I know from visiting Asheville for years. 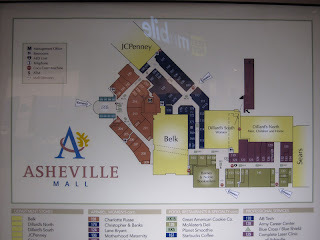 Ivey's: at Asheville Mall, Ivey's occupied the spaces numbered in the 150 group in the diagram of the mall above. It also included part of what is labeled as #145. From the outside, Ivey's looked like an in-line store, and totally different from Belk and Sears. At the same time, Ivey's had a store downtown on Haywood Street. This building is now an upscale hotel. Ivey's was never located on Patton Avenue. Both the mall store and the downtown store operated together through at least 1980, because their locations were listed on the back of their charge statements every month. BonMarche: the downtown BonMarche store was downtown on Haywood Street, about a block north of Ivey's. I believe the sign on the front now says "Earth Guild," but the BonMarche terrazzo is still on the floor at the entrance, as is the floor at the old JC Penney next door. I don't believe Ivey's bought out BonMarche, but rather they were bought by Meyers-Arnold. Meyers-Arnold, originally from Greenville, also had a store at a mall in Augusta, GA. They did not seem to operate large stores, and carried limited lines...but were still classified as a department store. So, the confusion still somewhat exists as to what was in anchor on the south side of the mall. My bet is that this opened as a BonMarche, with "The Bon" closing its downtown store at the time. Later, they were bought out my Meyers-Arnold. Penney's being at Innsbruck Mall is believeable, but I can't imagine Ivey's having a location there. That mall is too small for two anchors, it seems. Ingle's closed the old location at Innsbruck and opend a big new store immediately adjacent to Innsbruck, but as of May 2009, the only that missing from the old Ingle's was the merchandise inside. It almost seemed like Ingle's was trying to preserve this relic...as they should. The Meyers-Arnold buyout seems plausable, but the question is was Ivey's always in Asheville? "The Bon" looked like the major store for the city. 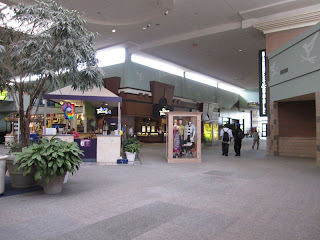 Was this Meyers-Arnold location at the abandoned Regency Mall? That location opened as Cullum's and ended up at the last as Upton's, so I'm guessing it must have been Meyers-Arnold from sometime in the early 1980's up to 1987. Was the Ingles at Innsbruck Mall the very first store? I understand the first store opened in 1963. Ivey's was on Haywood, but near Patton. Two auto centers stand at Innsbruck, Firestone at the front, and in the south rear stands another. I know Ivey's did not have auto centers, but Sears, JCPenney, Montgomery Wards, and Belk would have in the Carolinas. The anchor store at the south end of Innsbruck appears to be discount store in nature, and I'm thinking Belk, as Sky City and Rose's operated much smaller stores at the time Innsbruck opened. Innsbruck's name evokes a more upscale feel than the name Asheville Mall,though was very pedestrian, and the two malls complemented each other in the early days rather than competed against each other. Asheville Mall didn't really dominate the market until it was expanded in a defensive move against Biltmore Square. The Ingles at Innsbruck is #7, #1 was in Biltmore Village to the south of Asheville and is closed, its number retired. #2 is west of downtown on Leisceter Hwy and #3 is on Merrimon, north of downtown. #4 is also on Tunnel Rd, but further out past the I-240 interchange as you head toward the Ingles DC in Swannanoa. #5 is on Haywood, past Westgate and not far from #2 on Leicester. #6 appears to be gone, and has been recycled for the location in Thomasville, outside High Point in the Triad. #8 is the Black Mountain, in its third location in the former Rose's off I-40, next to its second location. All in all, finding details about Asheville's retail scene in the 50's-80's is scarce, and may be a result of the ecomonic bust of the Depression not fully lifting until the 1980's for the region. Downtown Asheville was left with and intact art deco district as a result of the 1920's boom that the Depression ended and by the time the area was prosperous again, downtowns were being rediscovered. I meant Grant's not Belk for the discount store at Innsbruck. I don't recall any Zayre's in the Asheville area. The only Grant's I remember being in Asheville was in the Westgate Shopping Center, pretty much right in the middle. I posted the comment on 9/24 as 'anonymous;' maybe I'll show up with a name this time. As for Meyers-Arnold: yes, they were in Regency Mall in Augusta. If the original store was a Cullum's, then this explain an expansion more for the company...making it totally logical, time-wise, for them to also buy Bon Marche in Asheville. Cullum's flagship store was in downtown Macon, and they never expanded into a Macon mall. I kind of doubt that Upton's bought M-A, but rather just "moved in," as they did in a lot of other parts of the country. There are several Asheville history books here, and many old pictures of the downtown Ivey's are shown. One of them shows the grand opening on the Haywood Street store, and the caption underneath implies that they moved from another section of downtown. This would have been in the early 50's, so it seems Ivey's had a branch in Asheville well before mid-century. I will be spending some time with folks Sunday who grew up in a house on the mountain behind these malls. They'll have answers to a lot of these questions, and I'll possibly clear up some of this after talking to them. Here's just one more take on the history of Asheville Mall, as supplied by a long-time Asheville resident. The mall opened with Sears on the west end, and Belk on the east. In-line stores connected the two. Prior to this, Sears was located downtown, and Rick said that once Sears left downtown, others started to follow. After the mall opened, Ivey's decided to build a second location in Asheville, and located at Asheville Mall. 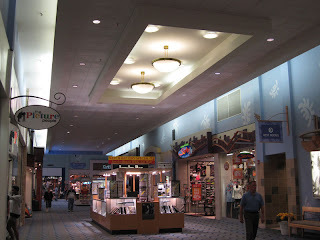 Instead of building a true anchor building, they ripped out a long string of in-iine stores front Tunnel Road, extended the front wall of the mall toward Tunnel Road a bit, and created an in-line anchor store. It's really not any different from the way the former Rich's [now Macy*s] in Lenox Square in Atlanta appears from the inside of the mall. Bon Marche came later. They had a store downtown on Haywood Street, and the store at Westgate. The Asheville Mall store replaced the Haywood Street location. The anchor on the west side of the mall was - in this order - Bon Marche, Meyers-Arnold, Montgomery Ward, Upton's, then Dillard's. He said there was also a two-story S&W cafeteria at the mall when it opened, and I believe I understood him to say it was where the former B. Dalton store was located. I guess it makes sense to have an escalator to take you downstairs when you've just stuffed yourself. As for Biltmore Square...his wife remarked that her mother, who lives near BS, said "everytime you go in there, something else has closed." That pretty much corroborates what folks have been saying. I lived in Asheville in the late 70's. Asheville Mall was the only one in the area then with Belk on the south end, Sears on the north enad, and Ivey's in the middle. The Bon Marche was in a small space, near Sears. It became Meyers-Arnold and then Uptons later on. The S & W was very strange. Instead of the serving line moving, the food spun around slowly, on a steam table carousel. The customer stood still and watched the food spin slowly around, and you grabbed what you wanted, as it passed. If you missed it, you had to wait for the thing to spin around again. It was called "S & W Carousel". Never saw an operation like that anywhere else. The S & W was huge though; it had alot of meeting space and banquet rooms on the secon floor - where the B Dalton ended up being located later. The main entrance was on the first level, next to Ivey's. There was also a very large Woolworth's inside the mall; I believe it was next door to Bon Marche. It had six or seven checkouts at the front door...always very busy too. Just when you thought this was over...I found the book "Asheville: A Pictorial History," by Mitzi Tessier, published in 1982. The original BonMarche "clothing store" opened on the ground floor of the Swannanoa Hotel in the 1800's. They later moved to a larger store on Patton near Lexington and became a more full-line store. BM moved into a "new building in 1923 at the corner of Hayward Street and Battery Park Avenue. The building was later occupied by Ivey's when BonMarche moved across the street to a larger store on Hayward. This was Ivey's first store in Asheville. The Lipinsky family owned BonMarche for over 80 years before selling it to the Meyers-Arnold chain from Spartanburg. Keeping faith in downtown Asheville, BonMarche was the last major department store to leave downtown, although they did operate stores in Westgate and only closed the downtown store after the Asheville Mall opened. There is also a picture of Westgate Center taken during construction of the expressway which necessitated a designated mall exit. The BonMarche store must have been expanded or at least had the front made larger, because in the picture, one would not know there was a department store at the end of the center. And before the 1989 renovation, right next to Ivey's was this tint hallway that abruptly ended. To the left was an elevator. You got on the elevator which took you one floor up to Sherman's Sports, which was not visible to any other part of the mall. I remember it as the only sporting goods store in Asheville in the late 80's. Thank you. My brother-in-law passed away from cancer. I have fond memories of trips with him and my older sister. He would insist we ate before we shopped, and it was at Annabelle's so we could people watch. I have been trying to remember it's name, but couldn't. Also the only movie I remember watching at the theater was Meet Joe Black. My mom took me on a date with my future step-father. There were huge rows of seats, but no aisle. I'm sure I saw more, but don't remember the names. Glad someone else remembers that hidden second floor with the sports store and game room. 1) Innsbruck Mall never had a JCPenney. 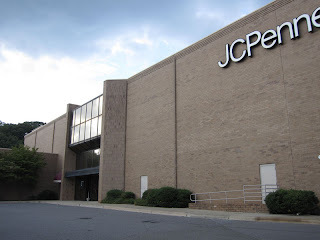 JCPenney was located downtown on Battery Park Avenue until 1989 when it relocated to Asheville Mall. The former store location was razed and is now 21 Battery Park luxury condos. The main anchor of Innsbruck Mall was a department store named Brendle's. It focused primarily on electronics and small appliances--sort of like a Service Merchandise. The chain went bankrupt in the 90s. Big Lots is now located in the former Brendle's building. I believe the 2nd garage-type building on the property may have been a Mr. Transmission. I just can picture the yellow sign from when I was a little kid. The other garage has been a Firestone for as long as I can recall. In the past, Innsbruck Mall had a decidedly Bavarian theme and was decorated as such. In fact, one of the previous draws to the mall was a German restaurant named the Bavarian Cellar (closed in mid 80s). The sterile, plain look happened after a renovation in the early 90s. 2) Original major anchors of Asheville Mall were Sears and Belk, both of which relocated from stores in downtown Asheville. There technically were 3 junior anchors at the mall: Bon Marche, Ivey's and Woolworth's. Woolworth's, which took up at least 3 in-line spaces, was situated near where the New York & Co. store is now and featured a full lunch counter. Bon Marche was a junior anchor located near Sears (it was never located in the Ivey's/Dillard's space). Bon Marche closed and the space was taken over by Meyers-Arnold in the late 70s. It remained Meyers-Arnold until the chain was purchased by Uptons. I believe Uptons closed in 1994 and that entire section of the mall was gutted. The 2-story Montgomery Ward was brand new construction and was located down a new hallway, slightly south of the Uptons location. Wards closed in 2000 when the entire chain faced bankruptcy. 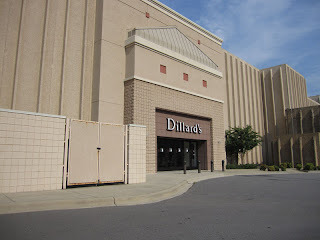 The store sat empty for 2 years, then was converted to Dillard's North/Men's Store in 2002. Ivey's, which was located center court, was sold/converted to Dillard's in 1990. This is now the Dillard's South Women store location. The Piccadilly Cafeteria and the former S&W Cafeteria were one and the same; Piccadilly replaced S&W in the early 80s, from what I recall. The area beneath the stairs (formerly escalators) leading up to the now-shuttered B Dalton used to be open to a vestibule. The vestibule had a gift shop, the main entrance to the cafeteria and restrooms. I believe there also was an elevator up to the second level of the restaurant where there was meeting space. The site of the current Barnes & Noble was previously Annabelle's Restaurant. In the late 70s, it had been named Tuesday's Restaurant (not to be confused with Ruby Tuesday's.) The restaurant was 2 levels with an eclectic "grandma's attic" theme: There was a large neon sign--a red & green palm tree--in one corner, an old traffic light suspended from the bar, lots of faux Tiffany glasswork, booths made from old train seats, a big staircase lined with street lamps, and so forth. Wow. Fun reminiscing about the mall! I spent enough time there over the years! The original anchor store for Innsbruck Mall was Mason's. I loved their record department because they had lists of the top hits chart for the nation that you could pick up for free. I still have an envelope full of them somewhere. I have been going to the Asheville Mall since it opened. The small upstairs that everybody talks about had a Baptist Book Store, the Mall Arcade where my friends and I spent many a dollar and the Mall offices. The tobacco store has always been in the same place. There was an Orange Julius just below Sears. Hickory Farms was on the other side that moved into the new connector until they moved out. The second floor of Sears was for picking up items bought out of the catalogs. I also remember my dad getting peanuts or cashews from the nut stand in Sears. 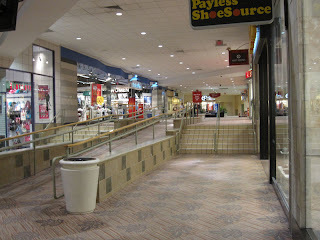 The Mall may have changed but the memories won't of this place that seems to strive while other places no longer excist. Barnes and Noble replaced McDuffy's. True, it had been Annabelle's, but Annabelle's was bought out by McDuffy's before the restaurant was permanently closed. My father was the Operations Manager during the 2000 renos and just this evening I was talking about the changes at this mall. 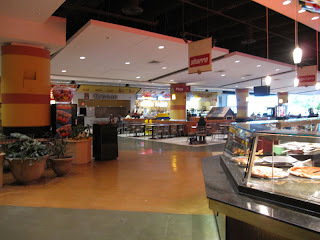 There didn't used to be a food court, for example. There was a ChickFilA right next to Sears, a McDonalds where Perfumania by JCPenney is now, etc. There was elevator access prior to 2000 via the Sunglass Hut store right next to Pipes LTD which took you upstairs to the mall offices. My understanding from my father is that there had been a functioning partial 2nd floor in that space at one time. I miss that movie theater around the side of building, too. $1 movies were kind to a poor teenager's wallet. There are many other stores/restaurants that I miss, too. Kaleidescope, World Winds, Piccadilly Cafeteria, Litchfield, Woolworths. My first job was in this mall and I spent my tween years there on Saturdays, I'm ashamed to admit. I worked for a brief time at World Winds back in 95! I'd just like to add that the elevator that was beside Piccadilly, took you to the second floor in between Four C's Jewelers, and Waldon books. As a former employee of Four C's, I saw many shoppers take a tumble down those dangerous stairs! The distance between each step was not the standard measurement, so many unsuspecting people not paying attention to where their foot was going, would wind up at the at the bottom of the stairs with bruises and scratches! As another bit of retro trivia, Four C's main competitors were Jewel Box and Alan's Jewelers, both of which were stores located center court near the former fountain! Litchfield Tavern and The Woolworth Cafe were among the places that I would eat lunch each day! I worked in security in this mall for a while in 1996, when the Coleman Family owned the mall. It by far was the best (not the most highly paying job) in my working career. We got to wear cool uniforms, the red polos and black baggy pants and shorts in the summer. 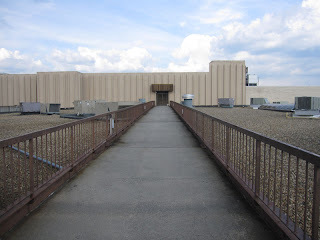 I got to go to many areas of the building pre 2000 renovation and one of my favorite places to go was the roof. Also, the catwalk going from the 1989 parking deck did not go into Dillards-it went into our security office and our maintenance office at that time. One of my favorite places to eat was Litchfield....they had good chili there. And I remember all of the places that Carrie talked about. We probally crossed paths in that mall. It really was like a family atmosphere when I worked there. I knew all of the mall staff and most of the mall staff knew all of the tenant staff. Like I said, it was the best job that I ever had, I literally got paid to go and hang out at the mall. The original major anchor store were Sears and Belk. Junior anchor stores were Bon Marche and Ivey's (both existed). Bon Marche then became Meyers-Arnold, and finally Upton's. A Woolworth (with Harvest House Restaurant attached) existed until the closing in the early 1990s, around the same as Upton's. That area of the mall was reconfigured to accommodate the new Montgomery Wards (later to become the Dillard's Mens store). The parking deck on the back of the mall was not original. It was added in the 1989 expansion. Only parking lot exited until then. 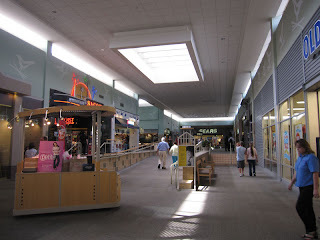 The photo you have of the crossover area between Belk and Dillard's Womens, showing the rectangular in the celling containing white lit area (near HairPlus) used to be an escalator going to a very small second floor area. The Baptist Book Store was located in this area. It was really a set of escalators to nowhere. 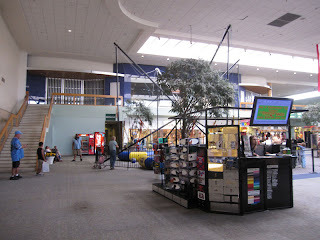 In the 1970s, I remember being at the mall when a child was hanging of the side the escalators in mid-air. Security had used the emergency stop switch to stop it, and rescue the child. You will notice the end of the corridor takes a weird sharp left, the mall back entrance used to be right there. The area beyond that is the 1989 expansion. Annabelle's was originally called Tuesday's (not to be confused with Ruby Tuesday). 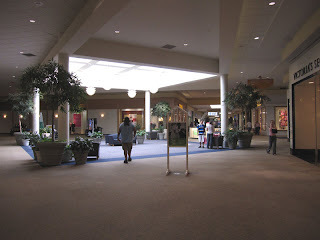 The center area of the mall in front of the Dillard's Womens store, used to have a hugh fountain. It was removed I think during the time Montgomery Wards came to the mall. That is a feature I miss at the Asheville. This was also used to be the area where Santa Claus and the Easter Bunny was during my childhood of the 1970s and 1980s. J&S Cafeteria never existed in the Asheville Mall. It was either S&W or S&S. Picadilly was located under the former B. Dalton (which was a previous Waldon Books). The escalator to this area was not added until the 1980s. This is a strange looking area over look the center area that over where the fountain used to be located. This area has recently been occupied by a Verizon Wireless store in 2010. The Asheville did not originally have a food court. Restaurants were located through the mall instead. This changed in the 2000 expansion. Sears upper level used to only house offices, warehouse, and catalog. They expanded housewares, appliances, lawn and garden in the 1990s. Escalators were not added until this time. 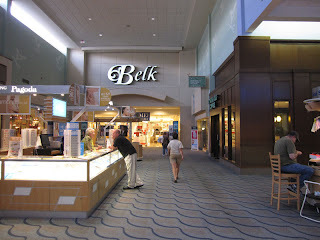 Belk originally only used their first level of their anchor as a shopping area. Second level opened to the public in the early 1990s. Escalators not added until this time. Ivey's was the only original anchor to have escalators, and utilize it's second level for a shopping area. 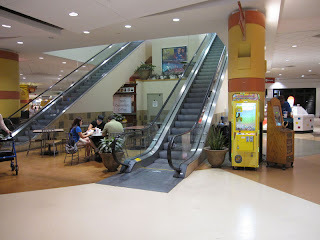 Other than that, the only other escalators were to the (Baptist Book Store/Nowhere Land) in the back corridor of the mall. Chic-fil-a opened in the late 1970s near Sears in an area that was originally a drug store. I do not recall the name of the drug store. The area where McAlister's Deli exists now was a Baskin Robins when the mall opened. At the time the mall opened it was a strange location for a mall. I-240 did not exist. The area near the I-240 where Beaucatcher Cinemas is located was Haw Creek Elementary School. I will agree with previous post, Litchfield's (located in front of the escalator to nowhere) had great chili. At the end of the 2000 expansion parking deck, and JC Penneys there used to be an Asheville Mall Twin Movie Theater. This was razed prior to the 2000 expansion. Each theater was hugh. I would say double the size of your average movie theater today. The S&W Carousel Cafeteria was a blast, for kids. We LOVED just standing there, as the food moved past us. I worked in management in the Asheville Mall from 1997-2000 and part-time at the hair salon and record store before that. I, too, loved World Winds, (and it's manager), and remember how creepy it was to take that elevator that went up to the mall offices. I'll never forget catching a brand new employee getting drunk at Annabelle's in the middle of the day on his break lol. I left right after the food court was created, which we all thought was a horrible mutant creation. The entire expansion seemed to destroy the unique mood the mall possessed previously, like a giant retail time machine. You could be there and feel peaceful until 2000. It suddenly felt like someone had let the cattle out of the gate after that. A lot of fond memories of that mall. The movie theatre was a treasure, I remember taking a very needed break from my ridiculous manager's schedule of over 70 hours a week to hide in there one day. Saw one of the most amazing films I've ever seen for a dollar, 'Hackers', which I thought had premiered that summer, but I guess they brought it back for a special run, because that was the summer of '98. The theatre was an oasis. What a shame it's gone now! 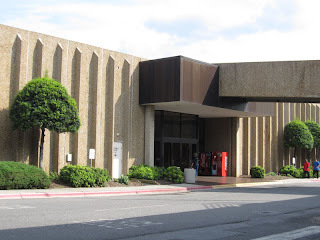 I grew up in Asheville and actually have family ties to the mall; I am related to someone who designed several of the renovations/additions mentioned. One of the things I remember the most is the water fountain -- we would always go and throw pennies into it upon our arrival -- as well as the Picadilly cafeteria. I sat on many a lap of an Easter bunny and Santa Claus there too. The hallway under the stairs from B. Dalton that you talked about was actually an old entrance to the Picadilly. It was right beside a gift shop that sold Crabtree and Evelyn products. There was a clothing store next to that and then a cookie company of some sort on the corner. Around the corner from that was a frozen yogurt place (eventually), and then a Lerner (now known as New York and Company). Also, the escalator Gregory mentioned to the small second floor area (near where an original exit used to be, prior to the 1989 expansion) led also to a miniature arcade at one point. I can remember going up there as a VERY small child with an older cousin of mine and playing pinball. A few other stores that come to mind are Curious Cargo (located on the North end toward Sears), the Peanut Shack, and the record store that was down near Belk/Annabelles. I am wondering if anyone knows what was the first restaurant called where Annabelle's is? To tell you the truth I'm pretty certain it's always been an Annabelle's.I do remember before the Gallery South addition was finished in 1989 it was a wall.On the left side near the pipe store there was a restaurant called Litchfield's and had pretty good food. My parents moved to Asheville in 1972. 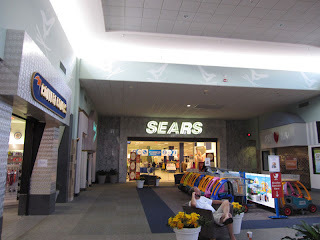 I remember when Sears was the only thing at the mall. The rest of the mall opened little by little in 1973. Dunham's piano store was right outside Belk's. I took piano lessons in the store from a Mr. Lawton Wilkinson. Dunham's moved to another location on Tunnel Rd. around 1979 or so to reduce expenses. I remember the Thanksgiving 1973 issue of the Asheville Citizen Times had a big article on the Asheville Mall, as well as a map or the original mall. I was only 9, but that newspaper section made a big impression on me at the time. If someone can find the Asheville Citizen Times Thanksgiving 1973 edition, you can see exactly what the mall was like. The former twin theater was quite unique, architecturally. It had two, large oval auditoriums, at an angle, and the exterior surfacing looked, as I remember it, very early-70s. Vertical-ribbing, with a cobblestoned (?) coating, of sorts. Does any one else remember the haunted house they used to have on the old second floor. I think it was near the old mall offices. I remember Annabelle's... great "loaded potato" I have a friend that helped build the mall. There was a helicopter lifting heavy building materials to the top and it crashed into the mall through the roof! One of the coolest things about the mall was the Chick-Fil-A that took up two spaces and actually wrapped around the Journeys store. Weird. I remember eating there many times. Also the Corn Dog 7 across the way. I do remember the mall stopped where Starbucks and Belk are now until about 1990. I remember the small 2nd floor area too, that was kind of dark and had the sports store as well. I tell people when I go through there that there used to be a set of escalators in the middle of the hallway and no one believes me. Kind of nice to know that someone else remembers that 2nd floor! I grew up going to this mall and have seen it undergo much transformation. The odd long hallway in the newer portion actually had a doorway upon original construction to provide an exit for the then new location for the Piccadilly cafeteria. It was located where the Charlotte russe is now. The very best part of the Asheville Mall was Annabelle's, it was a 2 level restaurant/bar with a nice long oak (I think) bar that took up most of the lower level with a very very small dance floor in the rear corner. it was always nice to stop in there for a few drinks before attempting to Christmas shop the mall and then to have one more for the road when you were finished shopping. Miss that place (Annabelle's) and that great bartender Kari who always had a smile on her face. I remember eating once at the Piccadilly Cafeteria there with my wife and kids in the late 80s / early 90s. I also remember looking around at the rest of the folks seated in the restaurant and whispering "I think we're the only people here eating with our own teeth!" It is funny to me to see others talking about the Asheville mall Annabelle's is where I went to eat before prom (as most of us did) and it was such a beautiful place! The mall has definitely changed through the years. At one time it seemed as if it were dying, doomed to be the next Biltmore Square. Now, business is booming once again. Does any one have any more information on Take 10 arcade? I would love to know more about it. Arcades are a dying art. The Asheville Mall pulled off a major coupe when the Biltmore Square Mall was announced. They started major changes that scored big with Asheville shoppers. The Biltmore Square Mall per lease agreement had a narrow list of what kind of stores could and could not be opened in the mall. No sporting goods was a major problem since the demographic area was mostly a "Sportsman Paradise". Since the Asheville Mall still had Woolworth's sporting goods, Sears sporting goods and a golf shop upstairs. 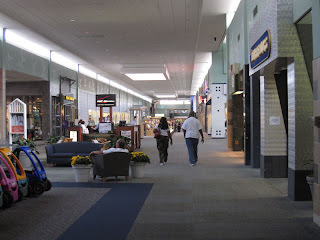 Men preferred to go to the Asheville Mall if they had to go to a mall! At that time, fishing , hunting and golf were top sports activities. With the additions to the Asheville Mall almost doubling the old mall, many people never made the change. I lived across from the Biltmore Square Mall most of my life: I still prefer the Asheville Mall !! Okay so my husband and I are arguing where Sbarros was located before the food court. I say it was across from McDonald's where As seen on TV is currently located. He says it is where the bathrooms are. In the corner. I have some insight as to the history of the mall being friends with the original developer. Gregory above corrected some inaccuracies so his post is good. The mall was never intended to be two stories. It seems so just because the grade falls from one side to the other. 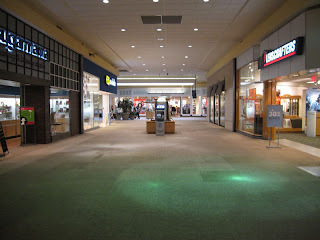 There was a small "upper mall" that did have an arcade but the spaces were hard to lease and that part was closed. The mall's development and construction was met with similar headwinds as many developments face - red tape and angry neighbors. One woman pulled a shotgun and threatened a bulldozer driver during the initial site grading. The city council was at odds with the way the approved site plan varied from the actual physical earthwork. At one point the council threatened to rezone the tract back to residential and/or not approved occupancy. The zoning threat came about after Mr. Coleman successfully sued the county in state court over their buffer zone requirements. Ultimately Mr. Coleman was able to get all parties satisfied enough to get the mall built but the situation made Sears nervous. Also before opening helicopter trying to lift a/c units onto the roof crashed into the roof instead but no real damage occurred. A crane had to come in and lift the helicopter off the roof. No one was hurt. The second story part that housed the B. Dalton bookstore was originally seating for banquets held by S&W and for years after S&W left sat empty. Mr Coleman Jr came up with the idea of putting the escalator (up only) in that spot and leasing out that area. During the original construction the water fountain didn't have a water source. Mr Coleman not wanting to put in a meter and pay for water simply extended the line from a nearby space. That tenant paid for the fountain's water without knowing it. That was until a one hour photo moved in. They use a lot of water and corporate watches the water bills and this location used more that the others. Noticeably more and somehow figured out they were supplying the water to the fountain and brought it up. The Colemans were a pretty bold bunch and their answer to situation was to simply remind the tenant that their lease was up at the end of the year and if they wanted to make something of it they could hit the road. They left and to this day the tenant in the space could still be paying for the water for the fountain. A unique fact concerns the mall's Chick-fil-a. In the '80s this company was just expanding out of Atlanta and wanted to be in the Mall. Coleman Jr didn't like their product but was OK bringing them to the Mall. Until the lease was negotiated... The rule was all stores had to be open during mall hours. No exceptions for Chick-fil-a that of course wants to be closed on Sundays. They went back to Atlanta disappointed. Then they approached the mall a second time with the same result. Mr. Coleman Jr simply did not budge on the rule. When they showed up a third time wanting in they agreed to be open on Sundays. From the mid 80s to 1997 when the Colemans sold the mall the Chick-fil-a was open on Sundays which is the only instance of this in Chick-fil-a company history. Once the Colemans were gone Chick-fil-a renegotiated their lease and have been closed on Sundays since. Some people don't believe this story but it is true. More below. The restaurant that has the outside access started as "Tuesdays" and was viable due to using the the fire escape hallway as access to the rest of the mall. The restaurant was two stories and along one large wall was a "Welcome to NC" large scale interstate sign that was obviously stolen as that wouldn't be available for public purchase (no Ebay then). The expansion in 1989 saw a food court of sorts in it (really just a concentrated area of food vendors). Food courts were new at the time and so the mall wasn't designed with that in mind. Sbarro's was original to this area. It was at this time that the parking deck was constructed. It leaked like a sieve at first and the Colemans successfully sued the company who put it in. Biltmore Square was at a huge disadvantage in a number of ways but habit was clearly one of them. People were just used to going to "The Mall" and didn't care to switch. The Colemans getting JCPenny to come here instead of going to Biltmore Square was also huge. The officials from JCPenny were considering where to locate and there was plenty of influence pushing them towards Biltmore Square. But somehow the Colemans were allowed to show both Malls to the JCP reps at the end of the negotiations. After that JCP went to Asheville. Later the owners of the BS were sued by the tenants who signed their leases with the expectation what JCP (or another large anchor) was going to locate there. That's all I have remembered at this point. The Colemans sold in 1996 or 1997 and the next era started. The record store in question was Family Record & Tape, owned and run by Frank and Zelda Kasey. I worked there in the mid-'70s and it was a fun crew. If memory serves, the albums were priced at $5.99 in 1975, then went up to $6.99 a few months later. The store also sold cheapo stereo systems that we played music on as a soundtrack for the customers. However, the owners would only let you open one or two 8-tracks in any given rotation, and those rotations could last for a few weeks, driving employees nuts with the repetition. I know I wasn't the only clerk there who hopes he never hears the Frampton Comes Alive! album again in this or any other lifetime. Sears has now closed. There has been talk about converting that section into apartments.